…The Devourer Wurm, that is, and I am the proud owner of 14 points of Circle Orboros: Baldur, Woldwarden, Wold Guardian, and Shifting Stones. Next week I will be heading to PAX, where hopefully I will be able to add the Shifting Stones UA, as well, bringing me to 15 points. Pinning the beasts was a chore, and I got too creative with the 'Warden--he's a little off-balance. Technically, I own 20 points since I got a Blackclad solo and a Lord of the Feast–one of my FLGSes was running a great sale on old models with new cards–but they aren’t part of the initial force. 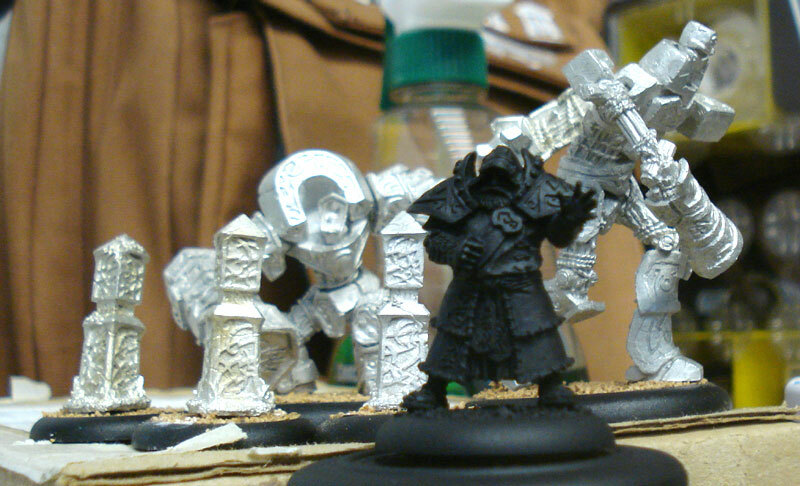 Funny, since when I was first looking at Warmachine I specifically said to myself that I had zero interest in Hordes. Anyway, now to start playing like I have a miniatures wargame rules book with a fifth page…after I paint these, that is.